More than anything, it was the hair that caused the crushes. Paul was the cute Beatle, at least early on, because he had the swingiest bangs. Later, it was Donny Osmond's eyes that stared out from under that dark, shiny swoop of hair. And in between there was Davy Jones, whose own bangs were straight and shiny and cut into a cute bowl of hair that would swing like a bead curtain when he played the piano. Was he really playing the piano? I wondered that as I watched the coverage of Jones's death. 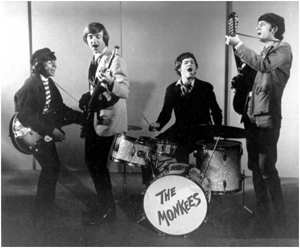 There they were in the old TV episodes, Davy and the Monkees singing "Daydream Believer" around the piano; Mickey Dolenz was wearing a goofy poncho, Peter Tork and Michael Nesmith faded into the background, and Davy was the star, bouncing and snapping his fingers while the bangs swung side to side. The coolest thing you could do back then was to wear a Nehru jacket, and Davy's was crimson. I was eight when they recorded that song, probably too young for much of a crush but old enough that the lyrics were carved into my brain. I can still sing every word. They're playing that song again this week because Jones has died, and hearing it brings a sweet stab to my heart. Remember what it was like to think you had a chance with a star? To live in that slim, bright space where everything was possible, and you were pretty enough and smart enough to hook a hottie like Davy or Donny or Paul? When we were in seventh grade, my friend wrote a long story -- page after handwritten page -- about how she ended up the girlfriend of Donny Osmond. The story opened with her sitting in the front row of his concert. In a matter of weeks she outgrew him, which is a good thing because by then I had developed my own crush and was writing stories about how I became Mrs. Osmond. I was grateful that she stepped aside. Heartthrobs are chosen, groomed and marketed to meet the exact desires of 13-year-old girls. Maybe I don't really get Justin Bieber the way my daughter and her friends get him, but I understand how a toothy grin or catchy melody or, yes, swoop of bang can cause a young heart to split wide open. This love for a face on a screen is as much about the girl watching as it is about the celebrity. Maybe these tween girls still feel good enough about themselves to think that, given the chance, Justin Bieber would notice them and find them interesting and love them back. How sad that our culture has a way of erasing that confidence in girls as they mature. My daughter is outgrowing the Justin Bieber stage, but the poster still hangs on her bedroom wall. He is posed with his hand on his hip, his head tilted, offering a slight smile, his eyes gazing out from under bangs arranged in a spectacular swoop. Not long ago, Justin cut the bangs -- perhaps a calculated move to show the world he's growing up, too. My own poster had Donny Osmond with the same pose, same smile, same bangs. And now, we're seeing old photos of Davy Jones. I can hardly believe he was 66, or that Donny Osmond is turning 54. But what cute boys they were. They were just what we wanted when we were 12. Beth Dolinar is a former Riverside resident and Pittsburgh television reporter who is staying at home to raise her two children.